SlateRichard Andree’s 1881 map of the Jews of Central Europe. Ashkenazic Jews were among the last Europeans to take family names. Some German-speaking Jews took last names as early as the 17th century, but the overwhelming majority of Jews lived in Eastern Europe and did not take last names until compelled to do so. The process began in the Austro-Hungarian Empire in 1787 and ended in Czarist Russia in 1844. In attempting to build modern nation-states, the authorities insisted that Jews take last names so that they could be taxed, drafted, and educated (in that order of importance). For centuries, Jewish communal leaders were responsible for collecting taxes from the Jewish population on behalf of the government, and in some cases were responsible for filling draft quotas. Education was traditionally an internal Jewish affair. Until this period, Jewish names generally changed with every generation. For example, if Moses son of Mendel (Moyshe ben Mendel) married Sarah daughter of Rebecca (Sara bat rivka), and they had a boy and named it Samuel (Shmuel), the child would be called Shmuel ben Moyshe. If they had a girl and named her Feygele, she would be called Feygele bas Sora. Jews distrusted the authorities and resisted the new requirement. Although they were forced to take last names, at first they were used only for official purposes. Among themselves, they kept their traditional names. Over time, Jews accepted the new last names, which were essential as Jews sought to advance within the broader society and as the shtetles were transformed or Jews left them for big cities. For example: The son of Mendel took the last name Mendelsohn; the son of Abraham became Abramson or Avromovitch; the son of Menashe became Manishewitz; the son of Itzhak became Itskowitz; the son of Berl took the name Berliner; the son of Kesl took the name Kessler, etc. Reflecting the prominence of Jewish women in business, some families made last names out of women’s first names: Chaiken — son of Chaikeh; Edelman — husband of Edel; Gittelman — husband of Gitl; Glick or Gluck — may derive from Glickl, a popular woman’s name as in the famous “Glickl of Hameln,” whose memoirs, written around 1690, are an early example of Yiddish literature. Gold/Goldman/Gulden may derived from Golda; Malkov from Malke; Perlman — husband of Perl; Rivken — may derive from Rivke; Soronsohn—son of Sarah. The next most common source of Jewish last names is probably places. Jews used the town or region where they lived, or where their families came from, as their last name. 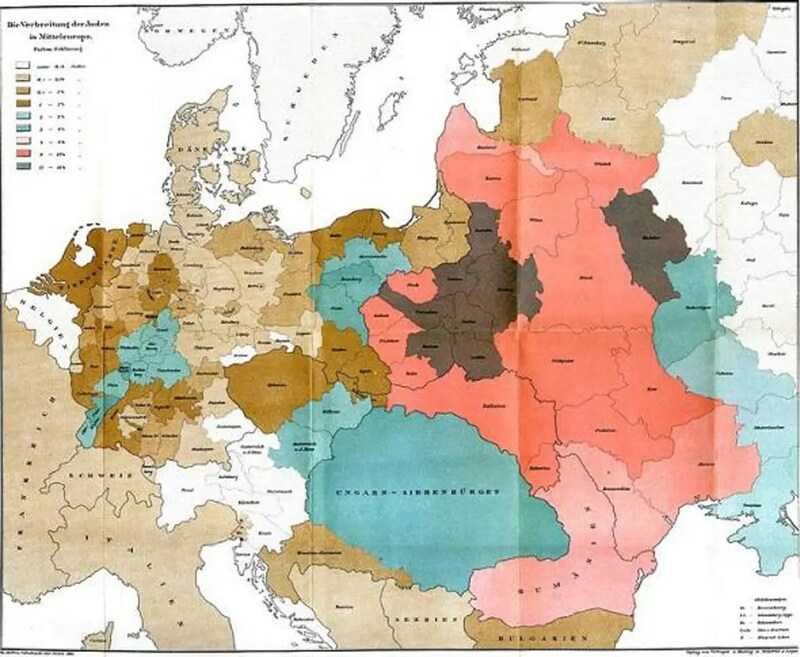 As a result, the Germanic origins of most East European Jews is reflected in their names. For example, Asch is an acronym for the towns of Aisenshtadt or Altshul orAmshterdam. Other place-based Jewish names include: Auerbach/Orbach; Bacharach; Berger (generic for townsman); Berg(man), meaning from a hilly place; Bayer — from Bavaria; Bamberger; Berliner, Berlinsky — from Berlin; Bloch (foreigner); Brandeis; Breslau; Brodsky; Brody; Danziger; Deutch/Deutscher — German;Drues ( Drus) ,Dorf(man), meaning villager; Eisenberg; Epstein; Florsheim; Frankel — from the Franconia region of Germany; Frankfurter; Ginsberg; Gordon — from Grodno, Lithuania or from the Russian word gorodin, for townsman; Greenberg; Halperin—from Helbronn, Germany; Hammerstein; Heller — from Halle, Germany; Hollander — not from Holland, but from a town in Lithuania settled by the Dutch; Horowitz, Hurwich, Gurevitch — from Horovice in Bohemia; Koenigsberg; Krakauer — from Cracow, Poland; Landau; Lipsky — from Leipzig, Germany; Litwak — from Lithuania; Minsky — from Minsk, Belarus; Mintz—from Mainz, Germany; Oppenheimer; Ostreicher — from Austria; Pinsky — from Pinsk, Belarus; Posner — from Posen, Germany; Prager — from Prague; Rappoport — from Porto, Italy; Rothenberg — from the town of the red fortress in Germany; Shapiro — from Speyer, Germany; Schlesinger — from Silesia, Germany; Steinberg; Unger — from Hungary; Vilner — from Vilna, Poland/Lithuania; Wallach—from Bloch, derived from the Polish word for foreigner; Warshauer/Warshavsky — from Warsaw; Wiener — from Vienna; Weinberg. Ackerman — plowman; Baker/Boker — baker; Blecher — tinsmith; Fleisher/Fleishman/Katzoff/Metger — butcher; Cooperman — coppersmith; Drucker — printer; Einstein — mason; Farber — painter/dyer; Feinstein — jeweler; Fisher — fisherman; Forman — driver/teamster; Garber/Gerber — tanner; Glazer/Glass/Sklar — glazier; Goldstein — goldsmith; Graber — engraver; Kastner — cabinetmaker; Kunstler — artist; Kramer — storekeeper; Miller — miller; Nagler — nailmaker; Plotnick — carpenter; Sandler/Shuster — shoemaker; Schmidt/Kovalsky — blacksmith; Shnitzer — carver; Silverstein — jeweler; Spielman — player (musician? ); Stein/Steiner/Stone — jeweler; Wasserman — water carrier. Garfinkel/Garfunkel — diamond dealer; Holzman/Holtz/Waldman — timber dealer; Kaufman — merchant; Rokeach — spice merchant; Salzman — salt merchant; Seid/Seidman—silk merchant; Tabachnik — snuff seller; Tuchman — cloth merchant; Wachsman — wax dealer; Wechsler/Halphan — money changer; Wollman — wool merchant; Zucker/Zuckerman — sugar merchant. Kravitz/Portnoy/Schneider/Snyder — tailor; Nadelman/Nudelman — also tailor, but from “needle”; Sher/Sherman — also tailor, but from “scissors” or “shears”; Presser/Pressman — clothing presser; Futterman/Kirshner/Kushner/Peltz — furrier; Weber — weaver. Aptheker — druggist; Feldsher — surgeon; Bader/Teller — barber. Bronfman/Brand/Brandler/Brenner — distiller; Braverman/Meltzer — brewer; Kabakoff/Krieger/Vigoda — tavern keeper; Geffen — wine merchant; Wine/Weinglass — wine merchant; Weiner — wine maker. Altshul/Althshuler — associated with the old synagogue in Prague; Cantor/Kazan/Singer/Spivack — cantor or song leader in shul; Feder/Federman/Schreiber — scribe; Haver — from haver (court official); Klausner — rabbi for small congregation; Klopman — calls people to morning prayers by knocking on their window shutters; Lehrer/Malamud/Malmud — teacher; Rabin — rabbi (Rabinowitz—son of rabbi); London — scholar, from the Hebrew lamden(misunderstood by immigration inspectors); Reznick — ritual slaughterer; Richter — judge; Sandek — godfather; Schechter/Schachter/Shuchter etc. — ritual slaughterer from Hebrew schochet; Shofer/Sofer/Schaeffer — scribe; Shulman/Skolnick — sexton; Spector — inspector or supervisor of schools. Alter/Alterman — old; Dreyfus—three legged, perhaps referring to someone who walked with a cane; Erlich — honest; Frum — devout ; Gottleib — God lover, perhaps referring to someone very devout; Geller/Gelber — yellow, perhaps referring to someone with blond hair; Gross/Grossman — big; Gruber — coarse or vulgar; Feifer/Pfeifer — whistler; Fried/Friedman—happy; Hoch/Hochman/Langer/Langerman — tall; Klein/Kleinman — small; Koenig — king, perhaps someone who was chosen as a “Purim King,” in reality a poor wretch; Krauss — curly, as in curly hair; Kurtz/Kurtzman — short; Reich/Reichman — rich; Reisser — giant; Roth/Rothman — red head; Roth/Rothbard — red beard; Shein/Schoen/Schoenman — pretty, handsome; Schwartz/Shwartzman/Charney — black hair or dark complexion; Scharf/Scharfman — sharp, i.e intelligent; Stark — strong, from the Yiddish shtark ; Springer — lively person, from the Yiddish springen for jump. Billig — cheap; Gans — goose; Indyk — goose; Grob — rough/crude; Kalb — cow. It is common among all peoples to take last names from the animal kingdom. Baer/Berman/Beerman/Berkowitz/Beronson — bear; Adler — eagle (may derive from reference to an eagle in Psalm 103:5); Einhorn — unicorn; Falk/Sokol/Sokolovksy — falcon; Fink — finch; Fuchs/Liss — fox; Gelfand/Helfand — camel (technically means elephant but was used for camel too); Hecht—pike; Hirschhorn — deer antlers; Karp — carp; Loeb — lion; Ochs— ox; Strauss — ostrich (or bouquet of flowers); Wachtel — quail. Some Jews either held on to or adopted traditional Jewish names from the Bible and Talmud. The big two are Cohen (Cohn, Kohn, Kahan, Kahn, Kaplan) and Levi (Levy, Levine, Levinsky, Levitan, Levenson, Levitt, Lewin, Lewinsky, Lewinson). Others include: Aaron — Aronson, Aronoff; Asher; Benjamin; David — Davis, Davies; Ephraim — Fishl; Emanuel — Mendel; Isaac — Isaacs, Isaacson/Eisner; Jacob — Jacobs, Jacobson, Jacoby; Judah — Idelsohn, Udell,Yudelson; Mayer/Meyer; Menachem — Mann, Mendel; Reuben — Rubin; Samuel — Samuels, Zangwill; Simon — Schimmel; Solomon — Zalman. Names based on Hebrew acronyms include: Baron — bar aron (son of Aaron); Beck —bene kedoshim (descendant of martyrs); Getz — gabbai tsedek (righteous synagogue official); Katz — kohen tsedek (righteous priest); Metz — moreh tsedek (teacher of righteousness); Sachs, Saks — zera kodesh shemo (his name descends from martyrs); Segal — se gan levia (second-rank Levite). Lieb means “lion” in Yiddish. It is the root of many Ashkenazic last names, including Liebowitz, Lefkowitz, Lebush, and Leon. It is the Yiddish translation of the Hebrew word for lion — aryeh. The lion was the symbol of the tribe of Judah. Hirsch means “deer” or “stag” in Yiddish. It is the root of many Ashkenazic last names, including Hirschfeld, Hirschbein/Hershkowitz (son of Hirsch), Hertz/Herzl, Cerf, Hart, and Hartman. It is the Yiddish translation of the Hebrew word for gazelle: tsvi. The gazelle was the symbol of the tribe of Naphtali. Taub means “dove” in Yiddish. It is the root of the Ashkenazic last name Tauber. The symbol of the dove is associated with the prophet Jonah. Wolf is the root of the Ashkenazic last names Wolfson, Wouk, and Volkovich. The wolf was the symbol of the tribe of Benjamin. Eckstein — Yiddish for cornerstone, derived from Psalm 118:22. Good(man) — Yiddish translation of the Hebrew word for “good”: tuviah. When Jews in the Austro-Hungarian Empire were required to assume last names, some chose the nicest ones they could think of and may have been charged a registration fee by the authorities. According to the YIVO Encyclopedia, “The resulting names often are associated with nature and beauty. It is very plausible that the choices were influenced by the general romantic tendencies of German culture at that time.” These names include: Applebaum — apple tree; Birnbaum — pear tree; Buchsbaum — box tree; Kestenbaum — chestnut tree; Kirshenbaum — cherry tree; Mandelbaum — almond tree; Nussbaum — nut tree; Tannenbaum — fir tree; Teitelbaum — palm tree. Other names, chosen or purchased, were combinations with these roots:Blumen (flower), Fein (fine), Gold, Green, Lowen (lion), Rosen (rose), Schoen/Schein (pretty) — combined with berg (hill or mountain), thal (valley), bloom (flower), zweig (wreath), blatt (leaf), vald or wald (woods), feld (field). Miscellaneous other names included Diamond; Glick/Gluck — luck; Hoffman — hopeful; Fried/Friedman — happiness; Lieber/Lieberman — lover. Jewish family names from non-Jewish languages included: Sender/Saunders — from Alexander; Kagan — descended from the Khazars, a Turkic-speaking people from Central Asia; Kelman/Kalman — from the Greek name Kalonymous, the Greek translation of the Hebrew shem tov (good name), popular among Jews in medieval France and Italy; Marcus/Marx — from Latin, referring to the pagan god Mars. Finally, there were Jewish names changed or shortened by immigration inspectors or by immigrants themselves (or their descendants) to sound more American, which is why “Sean Ferguson” was a Jew. The home of the bean and the cod. And the Cabots speak Yiddish, by God! A version of this post originally appeared on Jewish Currents. Bennett Muraskin is a contributing writer to Jewish Currents magazine and author of The Association of Jewish Libraries Guide to Yiddish Short Stories and Let Justice Well Up Like Water: Progressive Jews from Hillel to Helen Suzman, among other books. Do We Have the Right to Choose How We Talk About the Right to Choose?